Spring cleaning shouldn’t be reserved solely for your home. Maybe it’s time to share the love and spring clean your business too. Spring is just around the corner (hopefully) and as the seasons gradually change it’s a great time to dust of any cobwebs which have built up over the cold winter months. However instead of rearranging the furniture and cleaning the skirting boards, why not take a closer look at your business to re-evaluate what’s working and what isn’t. Not sure where to start? I’ve some quick and easy ways you can spring clean your business. Making some small tweaks to your existing processes can often have the biggest impact. What areas could be working better within your business? Maybe you need to add a few extra touch points to your sales process to ensure you close as many leads as you can. Or maybe you would benefit from some automation within your business. Now is the perfect time to give your processes and procedures a quick review to see what can be improved in order to increase productivity and sales and decrease costs. When was the last time you gave your social media a review, well now is the time to get started. Why not start by checking all your links are still up to date and that your profile pictures, banners and the like are all current. It’s always much better to find the errors before your customer does. It’s nearing the start of the financial year and thoughts may focus on the budget for the upcoming period. What better time to have a look through your contracts and see if there is anywhere you can improve things. Mobile phones, utilities and other contracts are all areas worth reviewing and negotiating. Dust off your mission statement and remember your why. As we head into the second quarter, now is the perfect time to refer back to your mission statement, business plan and goals so you can start work on mapping out new ones for the next quarter. Making any changes and tweaks now will save time in the long run. Take some time out to review you customer/client list. Do you have constant late payers? Or maybe you have the complete opposite with clients that pay early. Whatever the case, now is the time to identify the weak and strong points so you can put systems in place to deal with them promptly, thus ensuring your cashflow remains consistent. Once your income has been reviewed, it’s time to switch focus to your suppliers. Are all you suppliers performing as well as they should be? By identifying any issues, you can then consider the next steps. You may want to cut ties completely and look elsewhere, or simply work with them to resolve any issues. 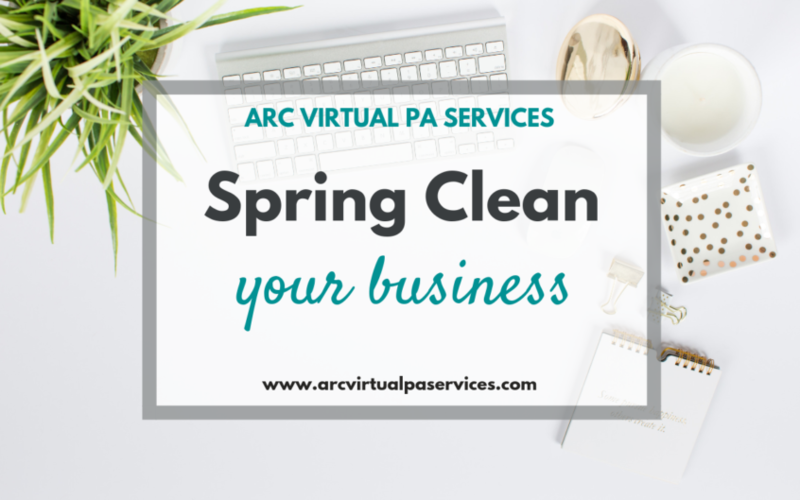 I hope this has given you some easy ideas on how to spring clean your business and as always, if there is anything I can assist with, please contact me.